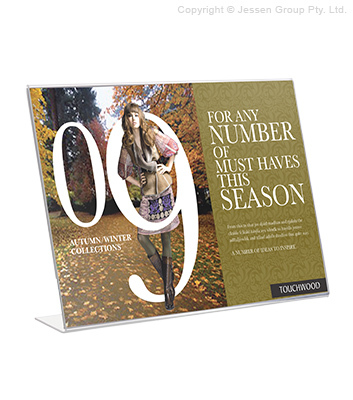 This classic POS sign holder displays one single sided A5 sheet in Landscape format (210 x 146mm). This style of holder has been effectively used for years, but now Slimline Warehouse is making them available at a wholesale price to the public. These acrylic sign holders are the cheapest and easiest way to add signage to your premises. They are ideal for shelves, counter tops, or anywhere that your promotional messages need to be changed or moved regularly to promote your products or specials. We also stock an Acrylic POS Sign Holder  A4 Format. POS Sign Holders can be used in almost any retail business - from fashion boutiques and cafes, to hardware and electronics stores. These displays are the simple and versatile way to make your customers aware of prices, specials and the details of your products.